Today we will be creating an acid lead sound. This is not really an emulation of sounds made on Roland TB-303 because in FM8 this involves a bit different technique. We will use modulator in combination with highly resonant filter to modulate our carrier operator. This will produce some very interesting effects which are suitable also for many other sounds not just 303 like acid synth lines. First, let’s set our carrier. Enable operator F. Set it’s waveform to soft square and route it to the audio output. Soften the operator F envelope attack and release times to avoid any clicks in the sound. Enable operator C. Choose sawtooth wave. Set self-modulation amount of operator C to 23. 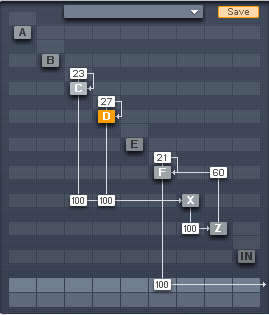 Now route operator A to noise and waveshaping module X with the amount of 100. Then route module X output to filter module Z again with amount of 100. Now route filter module Z output to our carrier operator F with amount of 60. Also set self-modulation amount of operator F to 21. So we are using filter and waveshaper just for shaping the modulator signal and then sending it to carrier F.
We will not be directly hearing the filter . 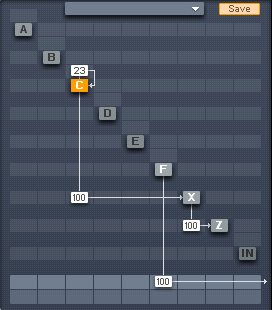 Only the effect it has on the frequency modulation of operator F.
Tweak the filter cutoff slightly at it’s highest values, if you go too low, the sound get distorted and unusable. Go to the carrier operator F and set it’s ratio value to 0. This means note pitch won’t have any effect on the frequency of the operator F anymore. Now the frequency of operator F will be fully determined only by modulating operator A. We do that to get rid of the bass frequencies in our carrier also the effect will get more pronounced. Now we could double this whole patch, to get a bit bigger sound. Enable operator D, this will act as our second modulator. Set it to sawtooth wave and set self-modulation amount to 27. We will detune both our modulators relative to each other. So set operator D ratio value to 1.0030 and operator C ratio value to 0.9970. Route output of operator D to filter X module with amount of 100. Now we need also second carrier. Enable operator E, set it to soft square waveform like we did with operator F.
Set operator’s E ratio to 0 and self-modulation amount to 22. Also soften the attack and release stages of the envelope to avoid any clicks. Also route the output of filter Z module to operator E with the amount of 60. Route output of operator E to audio output and pan both of our carries to left and right. This will give our sound some wideness. 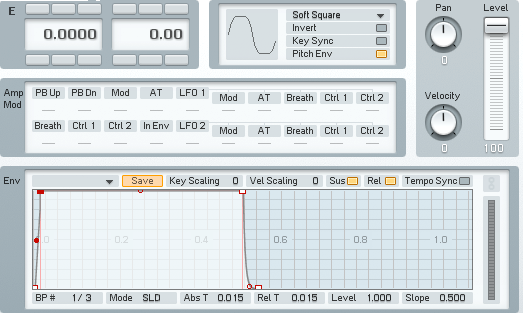 Let’s assign LFO to modulate our filter cutoff. Go to the Mod page of FM8. 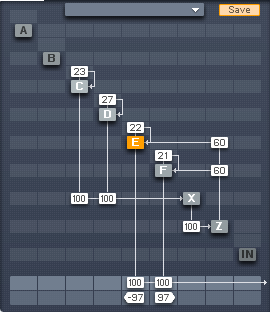 Set LFO1 like in the picture below and route it to filter module Z with the amount of 19. Also let’s add some effects. Got to the FM8 effect section and enable Shelving EQ. Boost the high frequencies so we get even sharper sound. I have used Ableton’s ping pong delay to give sound some tail. Now if you want to get even more screaming sound just raise the filter resonance. 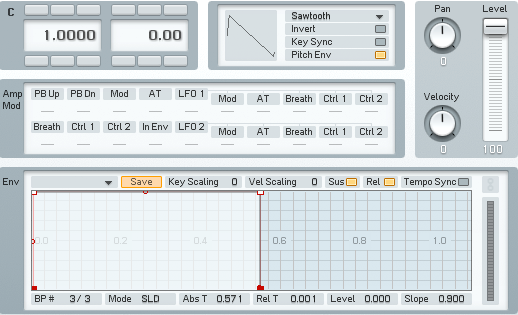 Experiment with different filter and waveshape parameters and modulation amounts. 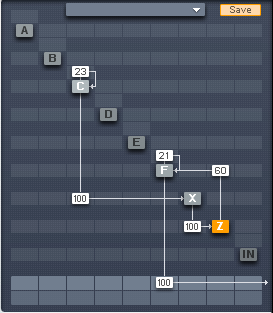 Also I recommend using another instance of FM8 playing same midi sequence for lower part of the sound. I have used simple sine wave with self-modulation amount of 51 and ratio set to 1. Also try other waveforms for carriers (or modulators). I’ve experimented a bit, and to my ears Soft Tristate and also Short Tristate works great for carriers. Be sure to set the same waveform for both left and right carrier since different waveforms respond differently to modulation. I’ve also included patch with four morph variations. This is not meant for real time morphing of the sound but rather as for separate variations of the sound. You can download the patch here. Hope you have enjoyed these tutorial.